In 1990, the St. Charles City-County Library District joined a network of libraries committed to providing free government information to the people of Missouri. 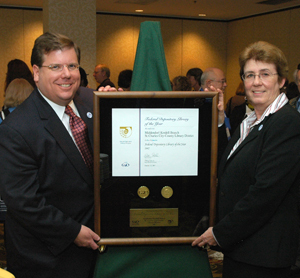 The District was awarded the prestigious Federal Depository of the Year Award in 2007. Public Printer, Robert C. Tapella, from the Government Printing Office (GPO) is shown presenting the award to Deputy Director Betty Murr. In active support of the mission statement of St. Charles City-County Library District, the Depository will provide Federal, State, and Municipal documents to Missourians. We acquire, process and organize, preserve, support, and promote the effective use of this information to supplement and support the academic curriculum and research needs of St. Charles City County Library District residents, businesses, non-profit organizations, government agencies, and the citizens of Missouri. This depository will serve as a catalyst to promote good citizenship and scholastic growth through information literacy. Located in the Middendorf-Kredell Branch, Federal, State, and Municipal Documents are housed in open stacks as well as ready reference and index tables. Documents are also accessible through the St. Charles City County Library Online Catalog. Within the library building, the fee for Local Area Network (LAN) access to electronic government information is waived for citizens of the 2nd Congressional District. The Depository hardware meets the “Recommended Specifications for Public Access Workstation in Federal Depository Libraries.” The collection is arranged according to Superintendent of Documents (SuDoc) call number classification system. To increase public awareness and usage of the depository, appropriate signs are positioned throughout the library, and decals adhere to all public entrances. All public entrances are flat throughways, and doors leading into our library’s main entrance have automatic door sensors. The Depository collection has been designated as a circulating collection, and items may be checked out for a two week period with a library card. Non-patrons who wish to use the collection’s resources are encouraged to do so in the library. There are some select items, which are designated as non-circulating, but loans may be granted through the Government Documents Librarian. The Depository is open and accessible during regular library hours. The Government Documents Librarian develops the Depository collection in consultation with other resource specialists and staff. The selection of government documents is coordinated with the information needs of the St. Charles City County Library District. Supplemental items are purchased to enhance the collection. Each year the item selections are reviewed by the Government Documents Librarian. The collection is almost entirely in English. We maintain a small collection of documents in other languages. The Depository selects information in all the available formats: paper, maps, CD-ROM, floppy disk, and electronic materials. Government Documents Reading Room, Middendorf-Kredell Branch, through the library public access catalog, and online.